A delicious selection of fresh seasonal fruit in a gold bowl (two gifts in one!). The perfect gift idea for Chinese New Year or Tet, this beautiful golden bowl of fruit can also be delivered with additional little treats such as sparkling wine, chocolate and candles. PLEASE NOTE: The pictured fruit bowl design and price is available for delivery in the Sydney Metro Region only. 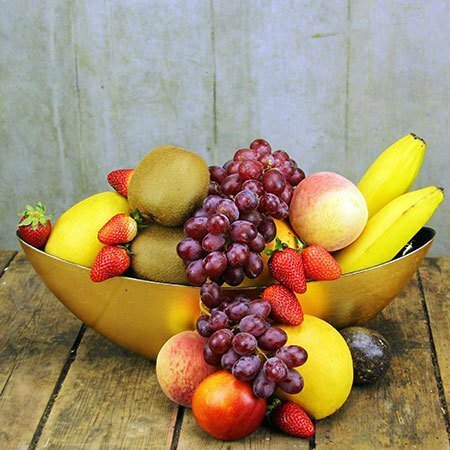 For a beautiful fruit bowl delivered outside the Sydney metro region, please ENQUIRE DIRECTLY on 1800 66 66 46 or email sales@flowersforeveryone.com.au Our fabulous team can provide advice and a custom quote to place your order via an affiliate florist network.